Scientists had theorized that a color photograph could be created by combining red, green and blue light, but the first person to prove this idea was James Clerk Maxwell (1831-1879). 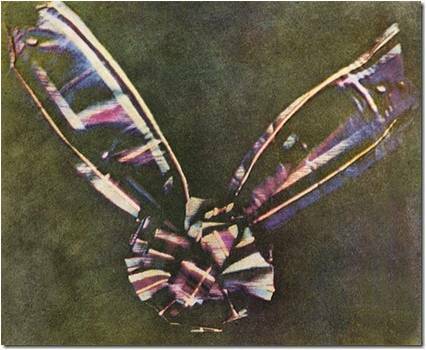 Maxwell created the first color photograph by combining three black and white versions of the same image. Each image passed through a different color filter (red, green and blue) before exposing a single screen. Maxwell, James Clerk, & Sutton, Thomas. Tartan Ribbon – 1861. Wikimedia Commons. Accessed: 22 July 2010.